Over the next few months we will continue to provide high quality, tailored training events for creative businesses, focusing on the areas where you have told us you need the most support. Places tend to book up fast so make sure you don’t miss out! We have places available on the Pricing Strategy for the Creative Sector workshop taking place on the 17th April in Ilkeston. Liz Foxwell-Canning will be delivering this workshop specifically to help you to understand the difference between cost and value - it could mean the difference between you making a profit and not making one! 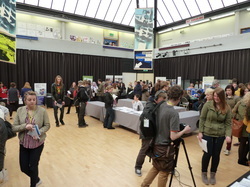 Creative Derbyshire hosted a very successful and busy Creative Careers Fair on 4 March with Chesterfield College. Over 350 people attended the fair with over 25 exhibition stands from creative employers, universities and arts organisations offering advice on jobs, apprenticeships, education and training. A series of ‘Creative Talks’ with Clare Gage Ceramics, Crush Design and Junction Arts provided valuable advice to young people about how to build a successful creative career. The event also offered a unique networking opportunity for businesses. Space4Work have put together for us a special offer throughout the month of May for creative businesses of 25% off their virtual office packages on addresses throughout Derbyshire and beyond. Virtual offices provide a range of services from telephone answering to a professional business address. If you wish to take advantage of this special offer visit www.space4work.com and insert the word creative into the voucher box on the checkout. If you need any assistance please contact lyn@space4work.com. If you have any offers you want to make to creative businesses across Derbyshire please contact us. Are you interested in taking on an Apprentice? We are working with a range of partners to secure opportunities for artists and creative businesses to recruit and employ Apprentices. An Apprenticeship is a work-based programme designed to meet employers' needs, which leads to a nationally recognised qualification. If you are interested in taking on an apprentice or learning more about what an apprentice can do for your business, we would greatly appreciate it if you could spare a moment to complete a few short questions. Please click here to complete the short survey. Whether you’ve just started up or are an established business, the Creative Derbyshire Roadshow will offer you an opportunity to meet other creative people, network and share ideas. The event will feature a bite-size marketing workshop led by Marketing Consultant Sharon Stevens-Cash, as well as talks, case studies and networking. There will be chance to hear the latest news and info from Creative Derbyshire, find out about support services for creative sector and make new contacts. We will also be featuring how small creative businesses can take on an apprentice. Drinks and a buffet will be provided. To secure your place please click here.